Now, here are some of my rare programs. The next three teams can't even be called "one-and-done", since they didn't even make it through their first season! I'll start off with the ill-fated Lansing Lancers of the IHL. I've only seen two Lancers programs on eBay, and I grabbed this one the second I saw it posted. 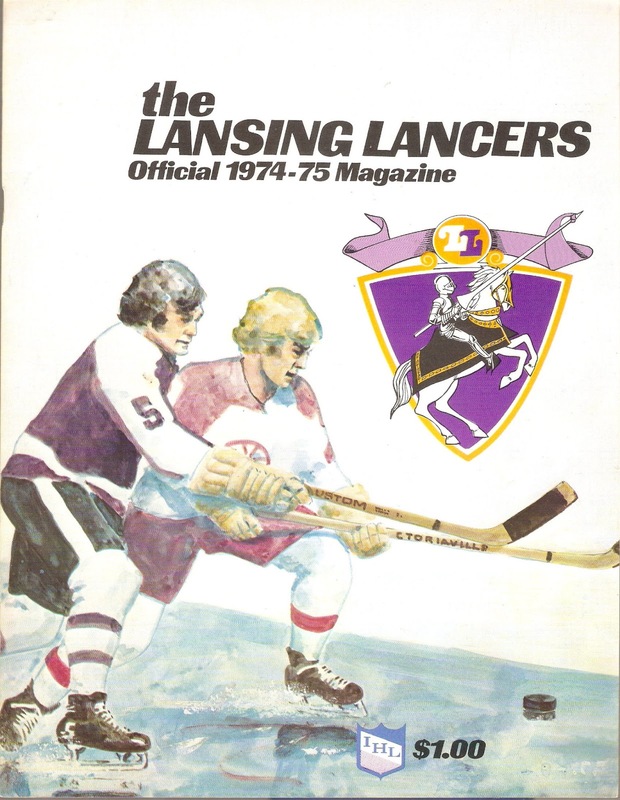 The Lansing Lancers arrived on the scene for the 1974-75 season, and were Lansing's first pro hockey team. The team had played the previous 11 years in Toledo, first as the Blades (1963-70) and the Hornets (1970-74). Declining attendance due to mediocre hockey teams eventually forced owner Paul Bright to relocate north to Michigan's State Capital. The team played their home games at the new Metro Ice Arena. The IHL media guide for that year listed capacity at 4600, but financial problems left construction incomplete, and the capacity stalled at 900. The Lancers, despite being an existing team, played like an expansion franchise, going 12-28-1 in their first season in Lansing. Crowds sometimes dipped to below 100 per game, and concerns about finishing the season were mounting. After a rejected attempt to relocate to Grand Rapids for the remainder of the season, the Lancers folded after an 8-2 loss to Muskegon on January 15th. Metro Ice Arena closed after it's first year of operation, reopened from 1976-78, then closed for good. In the mid-late 1990s, Lansing was rumored to be returning to pro hockey. The IHL was considering moving the mothballed San Francisco Spiders to town, and the UHL was also looking into adding a franchise in Michigan's Capital. However, none of these rumors came true, and Lansing has never had another shot at pro hockey. Maybe with a more competitive team and a suitable arena, Lansing would have worked in the IHL. Back then, they had several nearby IHL teams within 120 miles (Flint, Saginaw, Port Huron, Kalamazoo, Muskegon, Toledo). I don't really know much about the Lancers, but trying to run a Triple A hockey team in a 900-seat arena is asking for trouble. I'm sure that any debt from the franchise's Toledo days didn't help matters, either. As for Toledo, they were granted an expansion team for the 1974-75 season. With former Flags/Wings head coach Ted Garvin at the helm, the Goaldiggers would stage "The Miracle on Main Street" by storming to the Turner Cup title in their first year of existence. The Diggers would last through 1986, winning three more Turner Cups and be one of the strongest teams in the league. Great site. I write the minor league history/memorabilia blog Fun While It Lasted (www.funwhileitlasted.net). We have high quality images of over 5,000 minor league programs and guides on the site. I wanted to ask your permission to use your image of the 1974-75 Lancers program on our IHL pages, crediting it to your collection. Go ahead and use the Lancers image for your website. Thanks for reading, I enjoy your site as well!